Aside from a wide variety of services at reasonable prices, our exceptional location provides a safe, convenient area to explore and enjoy Rome's sights. In a few minutes’ walk, you can reach the main attractions. The Colosseum, Roman Forum, Basilica Santa Maria Maggiore, and San Pietro in Vincoli are very close, less than half-an-hour away on foot, and all parts of the city are accessible by public transportation (metro, bus or tram). The old building affording Italian flair is located on the Via San Martino della Battaglia near to the Termini train station. That is Rome's central hub for buses, taxi stops, subway and trains so you can always go where you want. (The nearest bus stops are: Catro Pretorio (metro MEB, MEB1) and Termini Central Station -metro MEA, MEB, MEB1). All public areas such as the lobby, lounge, bar and breakfast room are 24/7 accessible. The guests can cook for themselves in our well-equipped guest kitchen. The kitchen has a washer and dryer. If you do not feel like cooking, we also offer sandwiches, muffins, cookies and other treats in our snack machine. We offer free services as: Wi-Fi, bedding, towels (excluding dorms), maps and ticket information, guest kitchen, and luggage store room. Available for a small price: All-You-Can-Eat-And-Drink breakfast buffet for 7.90 euros per person and packed lunch at 4.50 euros per person. We also sell tickets for public transport, tickets for city tours, musicals. Washing machine and dryer are available. The well-equipped rooms have a Flatscreen-TV, free Wi-Fi and a private bathroom with high-quality furnishings. 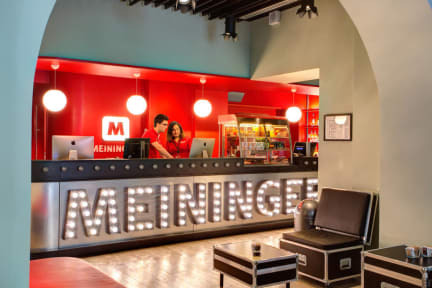 Due to the flexible room structure of the MEININGER Hotels, the accommodation options range from a classic double bedroom to a private multi-bedroom to a bed in a shared multi-bed room. - City Tax 3.50 euros per person/ night not included. What place ! Wonderful place to stay . Great rooms, well spacious and clean, large bathroom and clean and with an optimal shower. Only the kitchen that was not available to use when you want. In general I had a great stay, the hostel is well located and allows walking tours, has supermarket nearby, bus and train station. I recommend everyone no matter how you travel, work, leisure or with family, this Hostel can cater for all. Thanks. Amazing bedroom, very clean, good staff, plugs near the bed! The best price for value I’ve ever seen till now! 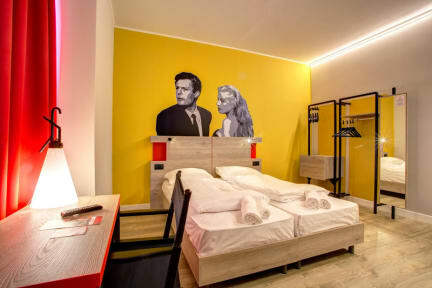 Muito bom hostel . Limpo , perto da estação . Recomendo . Mas não tem atividades para interagir os hóspedes . Poderia ser colocado armário nos quartos. Assim poderíamos colocar cadeado e ficar mais tranquilo. O hostel é seguro quanto a sua entrada, mas nos quartos isso deixa a desejar. Achei o café da manhã bem fraco também. O ambiente é agradável mas o pessoal do Hostel não tem nenhuma programação para que os hóspedes se interajam.